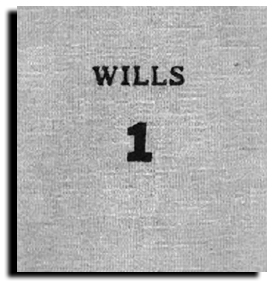 The volumes start with wills probated in 1872. And the very first will — on page 1 of Will Book 1 — stopped me in my tracks. A perfectly ordinary will. Nothing worth looking into for a family history. Except for one thing. One bequest. A horse, named Kate, to son John. Doesn’t it make you think? Doesn’t it make you wonder? What’s the story behind this? How many horses did the Colligans have? Did young John raise this horse? What was it about the bond of boy and horse that made it that important for the father to make this particular bequest in his will? It sure doesn’t sound to me like John trusted Jacob not to up and sell the farm right out from under his mother. What was Jacob like? And what happened to that farm, and to Jacob’s mother Mary, after John died? Why was the second son Thomas singled out to be joined with his mother in that one parcel of land? Did the oldest and youngest sons not get along with this middle child? Was Thomas closer to his mother than either of the others? What happened to Ann’s interest in this parcel when she died? Did Thomas end up with it all? Who the heck was that husband, whose first name never once appeared in that document? Clearly, she had the assets — so who was he and how did they come to be married in the first place? And why didn’t she trust him, not one little bit, with her property? Just what in the world had Alice Stillman done to make Francis name her like this in his will? Did she and Andrew ever make a go of it? What happened to these lots — and did the two daughters who got the $10 bequests ever talk to the daughter who got the $300 and the personal belongings… or was there a permanent rift because of the favoritism shown her? From the will, we don’t even know if Elisabeth was Reinold’s mother. And did Gunther really think he needed to school Reinold in every little detail — or was he just being one of those careful methodical Germans? Did Elisabeth live long and well on her $40, wheat flour, potatoes, milk and firewood? Did Reinold care for her and alleviate her wants? That kind of a love story wasn’t all that common. How did they meet? What kind of a life did they have together? What happened to Mena after Charles’ death? I hope he was as good to her as Charles was! Yes, it does make me wonder … what’s the story is behind that … err those. That’s my goal as well, Keith — I want the stories, not just the names. This was a delightful read! I enjoy your writing style and the way you choose topics and look at them with thoughtfulness and often a slight twist of humor. I tried commenting yesterday from my office, but it appears it did not send properly for some reason. I said in the failed comment that I am adding this and other posts from your blog to this week’s “Saturday Serendipity” post on The Prism. Thanks so much for the kind words, John! Two of my maternal pioneer ancestors left quite interesting wills of this sort. Fortunately, while we don’t know everything about the motivations, we have a pretty good idea. In one case my great-great-grandmother left similar (may even have been identical but I haven’t looked in awhile) inheritances to her youngest son and to his nephew, my grandfather, who had been brought up like brothers. Her son’s inheritance was in trust while grandpa’s wasn’t. Other children and grandchildren also inherited, but not as significantly. I’m pretty sure that this was largely in relation to the existence of Huntington’s Disease in the family. It wasn’t well understood in the 1920s but it looks like she thought her son might be at risk and supposed my grandfather wasn’t. Or that her son was getting to the age where her husband and some other children had shown symptoms, whereas Grandpa was younger and would have time to put his affairs in order first (neither one happened to inherit it, fortunately). The alternate explanation is that she didn’t get along so well with her daughter-in-law but did with my grandma. That’s iffier but certainly possible. In the other case it appears that one of my great-grandmothers felt she had given enough money to some of her children during her lifetime and thus didn’t need to leave them further money. She hadn’t been giving money to my grandma but did make her the executor. It’s neat that you have that much information, Karla! And how fortunate that the Huntington’s didn’t pass down the line more. We’re pretty grateful not to be in one of the branches with Huntington’s! Unfortunately, quite a few people did end up carrying it along.